No matter the size of your group, Pottery Bayou is the place to host your next event. Our studio is perfect for a ladies’ night out, office gathering, bridal or baby shower, holiday celebration, or other special event. Our passion is not only to help you create beautiful pieces of art, but also unique and memorable experiences. 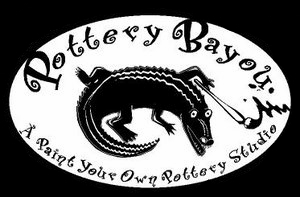 Whether your group is large or small, Pottery Bayou is the place to hold your next event. We'll provide the setting, tools, instructions and support. You are welcome to add your personal touch to the event with decorations and refreshments. The groups' pieces will be ready to pick up seven days later. During regular business hours, you are welcome to use our party room that comfortably seats 18 people. The room features its own paint bar, sink and restroom. Reservations are required, along with a $25 deposit. (The deposit will be deducted from your final bill on the day of the party.) When your group has more than six painters, the group studio fee of $6 per person applies. The total price of your party will be determined by adding the studio fees to the price of the bisque pieces your guests choose to paint. If your group is larger than 18, you are welcome to reserve the main floor of our studio, which can seat 32 guests. During regular business hours, we'll be happy to seat your group on the main floor of our studio. You may reserve the table(s) in advance by calling the studio at (574)267-2655. Reservations are strongly recommended for Saturday visits. If your party is happening after our regular business hours - we can help! Bring your friends and have the studio all to yourselves! Private party pricing includes a $10 per person studio fee (minimum of $100) and the price of the pieces created during the party. Party time slots are 10a-12p, 1p-3p, 4p-6p Monday-Saturday. Sunday party slots are 12p-2p OR 2p-4p. To make your reservation, please call (574-267-2655) or visit our studio to make a $25 deposit on the Party Room. Deposit will be subtracted from your bill on the day of the event. To help ensure availability and proper staffing, please make your party reservations 2–3 weeks in advance.